GMSbiotech is an innovative diagnostics company developing microarray test kits for various DNA and Protein based disease state applications. 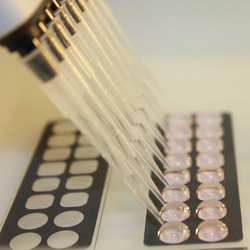 We have created and are introducing game changing microarray technology with the brand name GMSbio-Chip. These products are easy to use, cost-effective, require no upfront sample prep and provide high quality resolution….we pride ourselves on taking the hassle and added expense out of molecular diagnostics testing. That’s why we are called GMSbiotech---Genetics Made Simple (GMS). We are focusing our solutions on HLA typing for transplantation Pre & Post transplantation antibody screening, transfusion medicine, prenatal genetic screening, virology, multidrug resistant STDs and HPV to name a few. Our research has shown that customers want user friendly, low cost, high resolution products when it comes to molecular and protein based testing and our mission is to serve and partner in their growth and success. We will accomplish this through the highest quality service, providing cutting edge solutions and a commitment to helping them meet their goals.